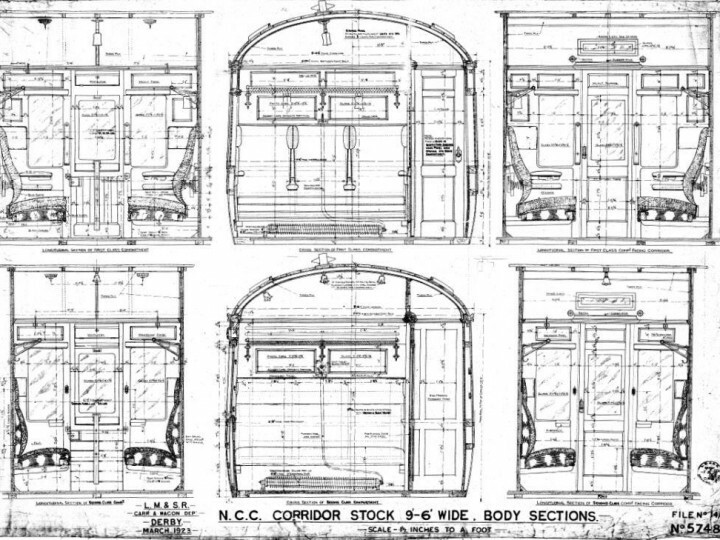 NCC No 68 was built in late 1922 by the Midland Railway at Derby to Drawing 5398, Diagram D1281, Lot 971, one of a batch of fourteen 57' corridor First/Third composite coaches. It was originally numbered 3421 by the Midland Railway, and it was renumbered by the LMS in 1933 to number 4914. 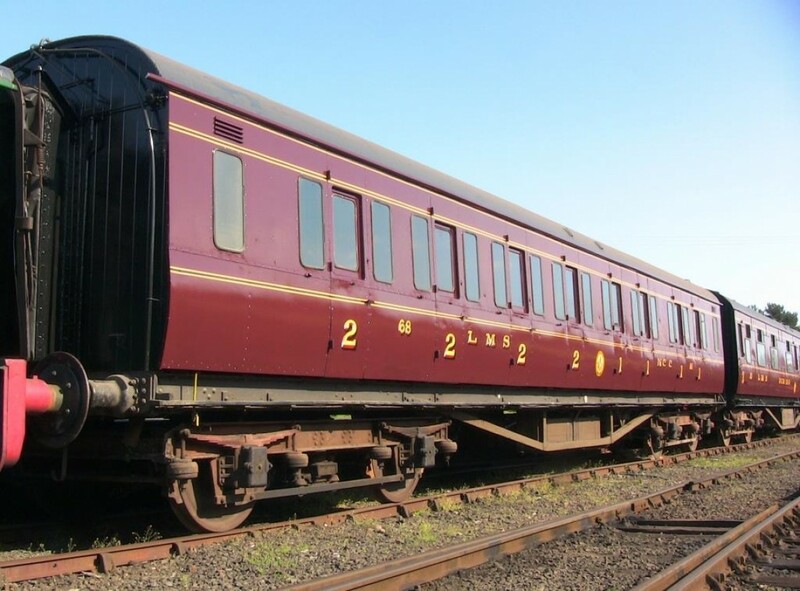 - Total length over buffers 61'2"
There were two full-sized first class compartments seating three people facing each other across the compartment, and unusually two "half" first class compartments seating just three people across the width of the compartment. 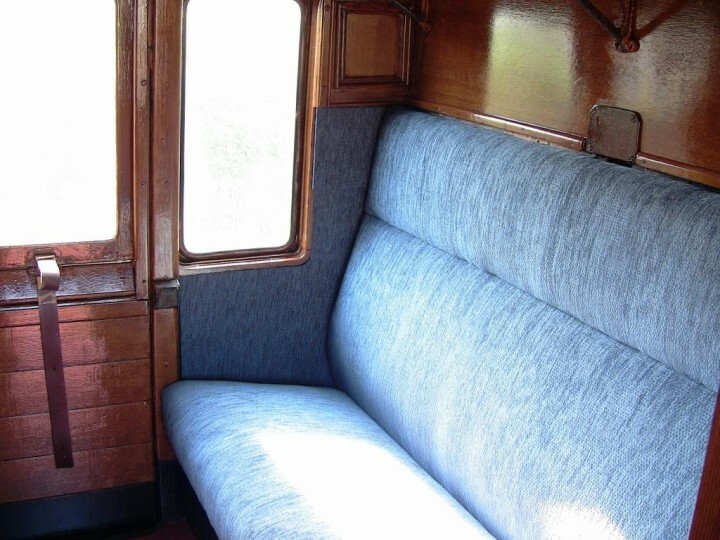 These became known as "honeymoon compartments", and often a helpful railwayman would make sure that newlyweds got one to themselves! 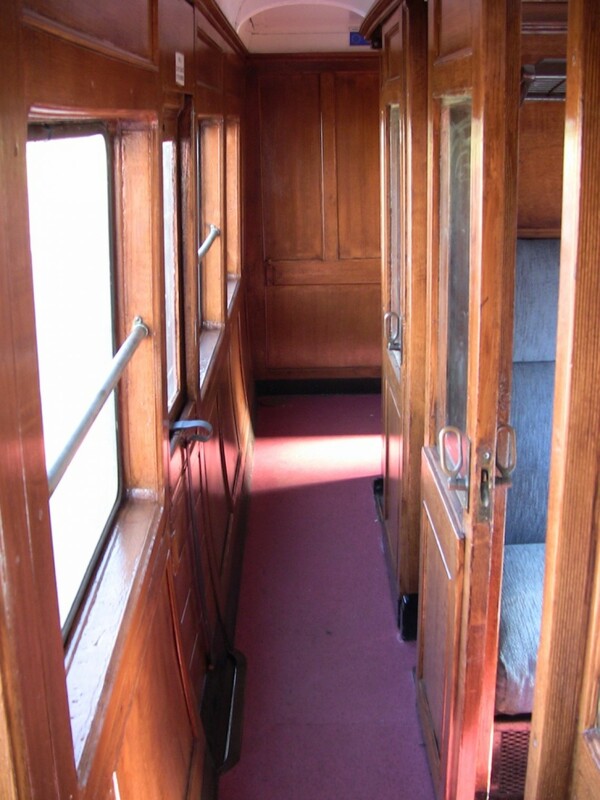 There were four third class compartments, each compartment seating eight people, facing each other. An interior door halfway along the side corridor separated the two classes. Two toilets were provided, one at each end of the corridor. 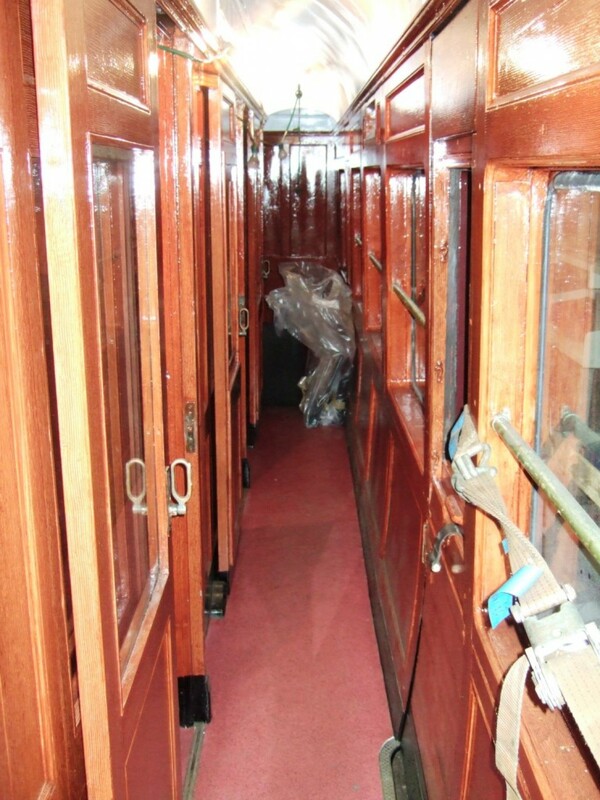 Each compartment had its own exterior door (total 8), there were four doors on the corridor side, two in each class. 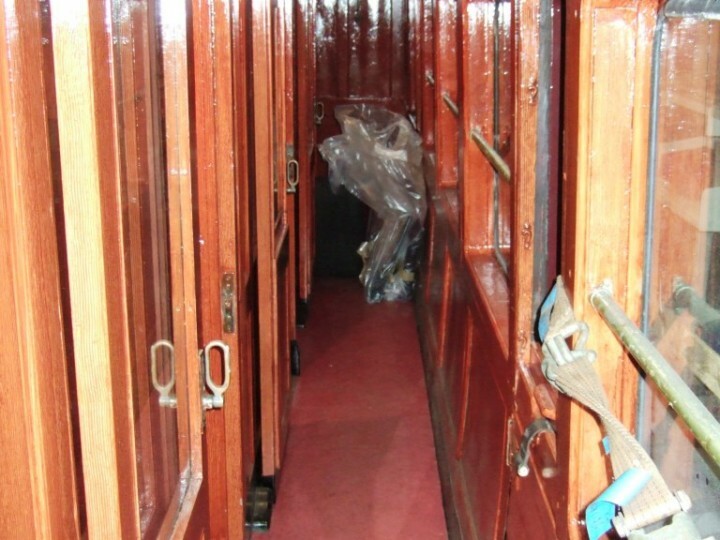 Half the compartments in each class were branded "Smoking", rather than the more modern way of branding "Non-Smoking". This lot of carriages had a new design of steel underframes, using heavy angle trusses in place of the then traditional round bars. 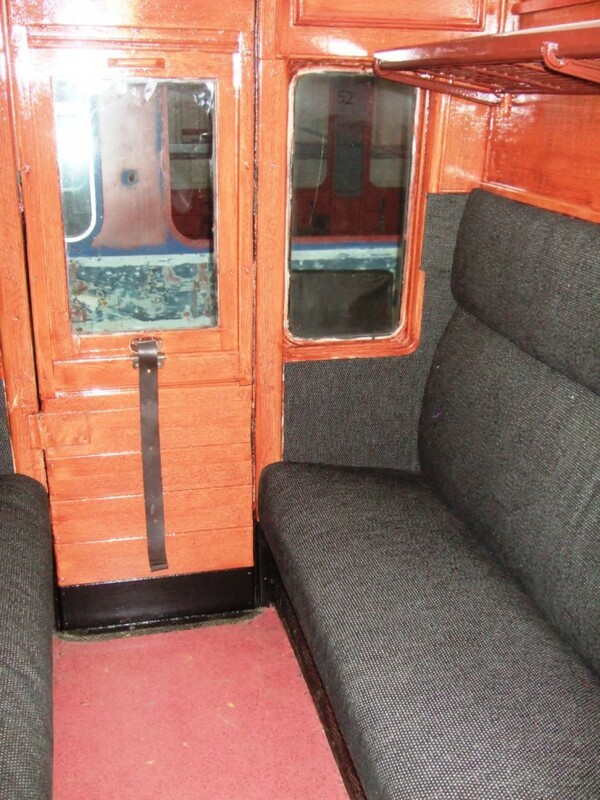 The coach-body was similar to previous lots save for matchboarded ends in place of panelled ones. Following the intense air-raids on Belfast on 15th April and 4th May 1941, when York Road was severely damaged, the LMS sent 20 coaches to Belfast to replace those lost, where the NCC re-gauged them from 4'8½" to 5'3". The LMS eventually sent 52 coaches to replace the losses, the last eight arriving in late 1948. Out of the fourteen coaches in lot 971, three were withdrawn in April, and one in July 1942, and these four came to the NCC as replacements. That left 10 to work on the LMS; the first withdrawal in BR days was in May 1955, the last member of the class was withdrawn in July 1960. 4914 was one of the second batch, arriving in 1942; it became NCC number 68, class F3, (her sisters were numbered 64, 65 and 69, taking the same numbers of NCC composite coaches destroyed by enemy action). In 1959, under the UTA fleet re-numbering excercise, 68 became 274. The carriage worked with NIR until withdrawal, and was acquired by the RPSI in 1978, a mention in Five Foot Three 22 (Summer 1978) mentions a plan to break up the coach and use the bogies for diner 550 (NCC 87); fortunately the carriage was placed in storage! 68 gets a mention in FFT 29 (Winter 1983-84), in that work is being undertaken by NIACRO; a further mention in FFT 30 (Winter 1984-85) notes that it had been delayed entering traffic. FFT 31 (Summer 1985) heralds the return of fully restored 68 to running again. 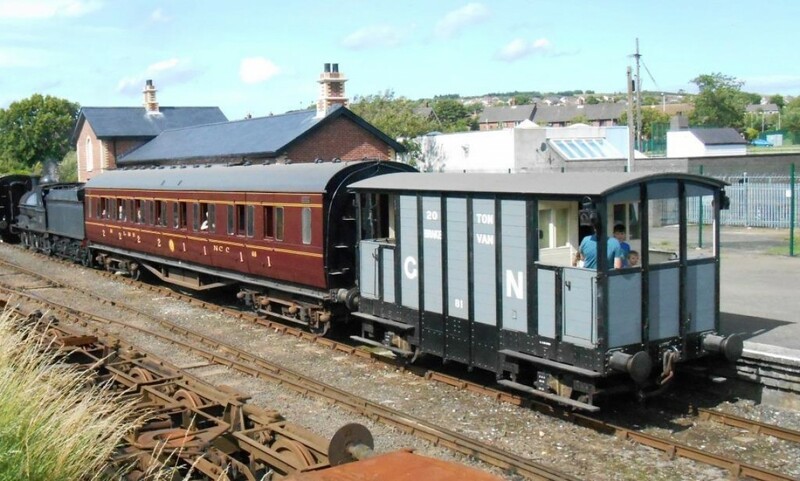 It was used on our main line steam trains until 2003. Increasing safety legislation caught up with the RPSI's ageing steam-era 'heritage' (wooden-bodied) fleet and they were withdrawn from mainline service and replaced in Northern Ireland with more modern metal-bodied stock of Mark 2 coaches. This meant that a new role had to be found for 68 (and the other wooden bodied stock) or risk a gradual slide into disrepair as more pressing requirements took priority. Previously Diner 87 was converted into a museum of railway tourism and dining services as well as retaining her tea bar. 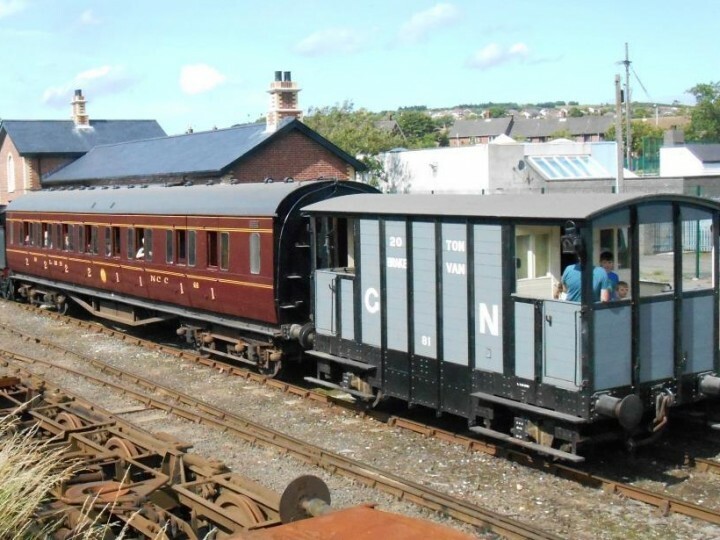 Thanks to a Northern Ireland Museums Council grant, carriage 68 has been restored from part-dereliction to carry and educate passengers within the Whitehead Railway Museum site as a cherished and cared for part of the Museum collection. 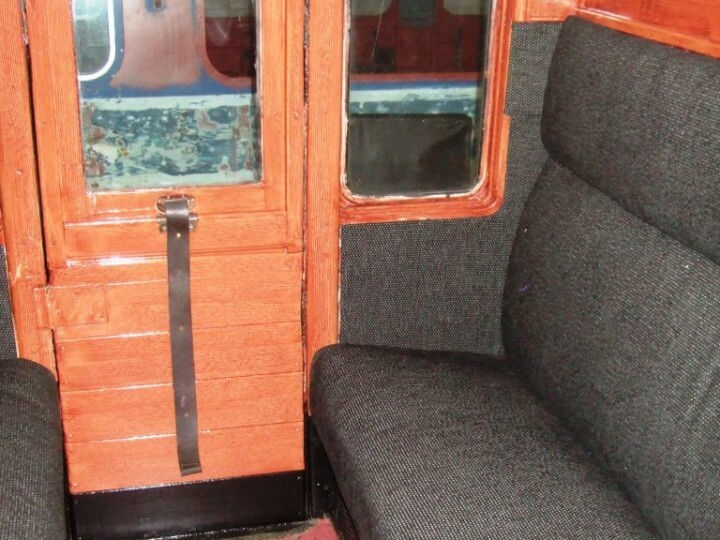 With the potential to seat passengers in comfort, and offer a variety of classes, 68 was an ideal first passenger-carrying wooden vehicle to restore. 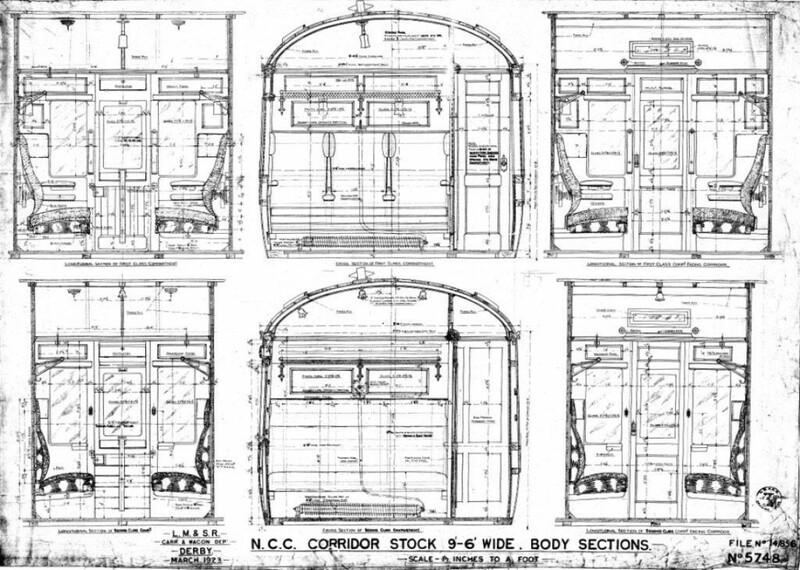 The Compartment Plans for NCC coaches were used as an aid to the restoration to make it as reasonably close to the original as could be, bearing in mind budget. The top centre diagram clearly shows the (missing on 68) corridor door. 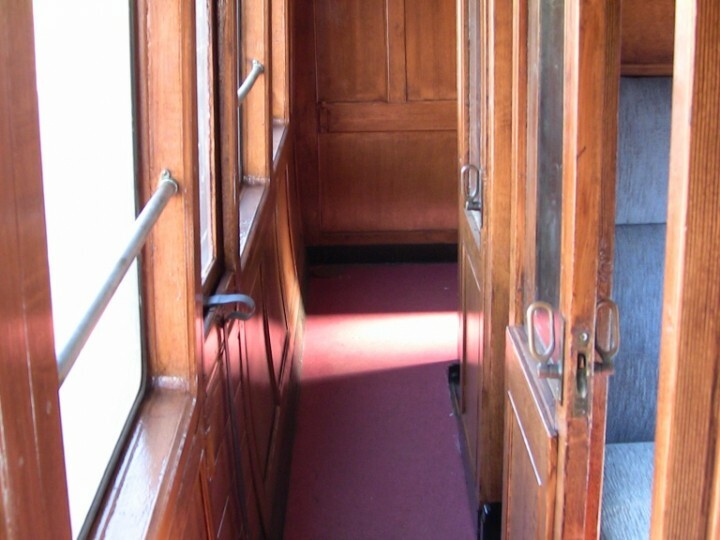 Internally, the compartments were painted with a simulated walnut finish with blue upholstery for the First Class, and a mahogany finish and black upholstery for Second Class. Since restoration, 68 has been used on the days of train rides at Whitehead, using the ex GNR(I) brake van as a guard's van. When not in service it is one of the main exhibits in the Whitehead Railway Museum. For further information and diagrams see Midland Railway Carriages Volume 2 by R.E. Lacy & George Dow, Wild Swan Publishing Ltd. 1986, and Five Foot Three 45.